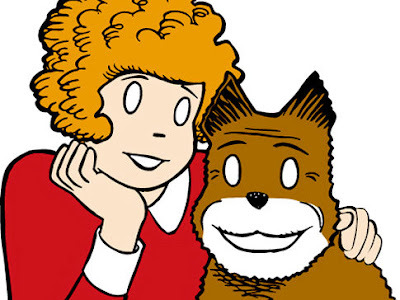 First up is Little Orphan Annie. Down to only about 20 papers in its last years—and being drawn by indy veteran Ted Slampyak—the strip's iconic status and its licensing potential probably gave it a far longer shelf life than most other strips would have. But as the interview with the licensing person at Tribune Media Services shows (the strip's only syndicate in its 86-year history), the realities of the shrinking newspaper business finally took its toll. It's clear the syndicate considers Annie to be a lucrative property, and plans to explore the new media landscape for new ways to keep the property alive. Though I grew up with the strip since it ran in the Tribune's sister paper in New York, the Daily News, I didn't read it much, though I certainly was aware of its history: in fact, I devoured many of the strip's adventures in book collection, primarily in Great Comics Syndicated by the Daily News-Chicago Tribune and various collections in the 1970s. Shifting gears, NBC also recently announced the cancellation of Law and Order, the original show that started the L&O franchise. While I wouldn't say I watched the show religiously, I did this season begin watching it fairly regularly again. As it has been throughout its entire run, the series was a dependable and addictive hour of television, solidly constructive and engaging. Since the show was no longer new and shiny, and people took it for granted, some observers noted that the current cast was never one to be found on anyone's "most sexiest people" lists, though the relatively young cast (as seen in the picture at left) certainly qualified! Series creator David Wolf has been a bit coy about the actual demise of the show, implying it may return in some form (perhaps on a cable channel?). The series was NBC's go-to show this past season when the fourth-place network's Jay Leno at 10 p.m. experiment crashed and burned, and the channel had no other dramas to fill its schedule, so I think L&O deserved much better than this—especially since it would have broken Gunsmoke's record as longest-running drama next season. Finally, a goodbye to ABC's ignored-but-critically-praised sitcom, Better Off Ted. I've already written about the show so I won't go into depth at how this smart, funny and quirky show—which also managed to have a heart—deserved better promotion and more time to find its audience, but I do think the television landscape is poorer for its cancellation.